David Beckham is due to fight an allegation of speeding in a Bentley over a technicality. The former England football captain, 43, is accused of driving a Bentley at 59mph (95km/h) in a 40mph (65km/h) zone on the A40 in Paddington on 23 January. His lawyer Nick Freeman told Wimbledon Magistrates' Court there was "no issue" with the speed alleged but said the notice had arrived one day too late. 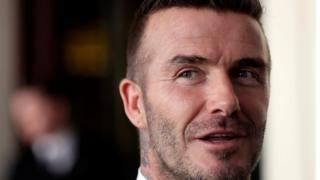 Mr Beckham, who was not at the hearing, has previously pleaded not guilty. Mr Freeman, commonly known as Mr Loophole, told the case management hearing the notice of intended prosecution was "defective" because it arrived one day outside the statutory 14 days. "I'm not disputing it wasn't served. I'm saying it was served out of time," he said. The trial is due to take place on 27 September at Wimbledon Magistrates Court. Mr Beckham is not expected to attend the court, his lawyer said.